If you haven’t played Mafia with your classes yet, don’t wait any longer! The kiddos love Mafia because it’s really fun. 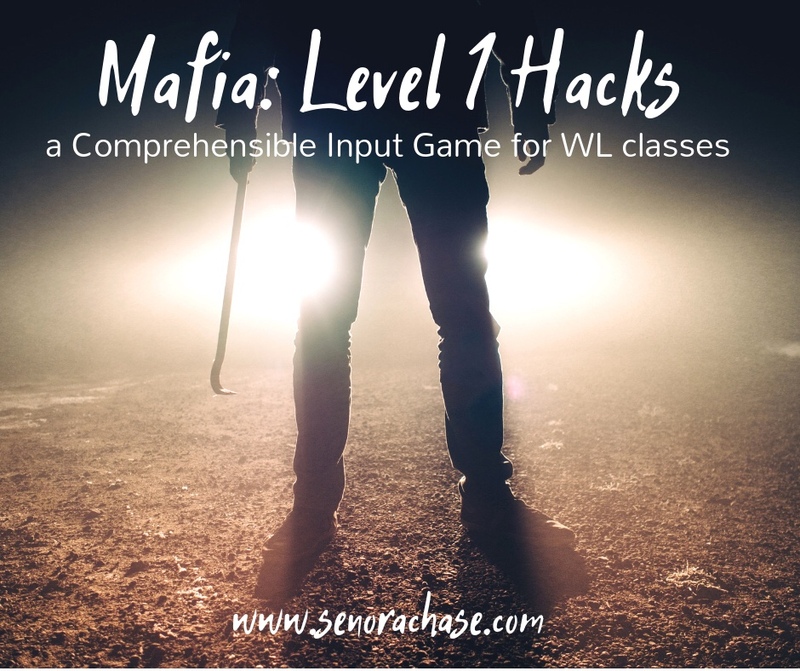 This teacher loves Mafia because they get SO MUCH input, they’re totally engaged, you can adjust your language for your kiddos, personalize it and it takes ZERO prep. What’s not to love!?!? And we have as much fun playing Mafia in level 1 as level 4. It’s my go-to game after they’ve finished a Celebration of Knowledge, when the internet/ electricity craps out, they’re out of control excited because it’s homecoming week and they’ve had a pep rally and they’re too hyped up to focus, or when randomly 16 kids are absent and you need a plan B. Enter Mafia. Here’s Martina Bex’s awesome Mafia Explanation . .. I’ve simplified Martina’s version and made a few changes make it work for my Spanish 1 kiddos right at the beginning of the year. We’ve been in school only about 9 weeks….they don’t have too much language yet, but by being deliberate and repetitive with my language, my kiddos are able to play, understand and love Mafia. -Project this: Level 1 Mafia in Spanish If you teach a language other than Spanish, I’d be ever-so-grateful if you translate it and share it with me, so we can share it with others! Let’s spread the love! -Have everyone move their chairs in a circle. -Print this page(Spanish) for you to take notes during the game. Here’s the French Teacher Notetaker. -Prepare playing cards. Any old deck of playing cards will do. For a large class, sort out 3 Aces, 2 Kings and enough number cards so everyone will get a card. For Medium or Small classes pick out 2 Aces and 1 King and enough number cards for each student. Shuffle up the cards, put them face down, and walk inside the circle, allowing each student to pick a card. Tell students that their card is their secret identity. They can look at it, but they can’t show it to anyone else. Explain the identities (Slide 1 of power point) I’ve found that it’s best to explain to students that ANY Ace is a Mafia, ANY King is the Police… for you seasoned Mafia player, you’ll notice the Doctor is missing. It seemed to unnecessarily complicate the game so I removed it. -Teach the game. Tell them that you’ll give them instructions in Spanish and they’ll have to follow the directions. Show slide 2 with the instructions you’ll give them. The first time we play, I explain the game in English: When I say, “La clase se duerme”, all students will close their eyes…then I’ll say “La mafia se despierta”…the mafia will look at me and I’ll say “La mafia ataca a una victima”. Silently the Mafia will agree on a victim and will signal to me who the victim is. Then I’ll say “La mafia se duerme”. Then, “La policía se despierta”. The police will look at me, then decide on someone who looks suspicious that they would like to investigate. Silently they’ll signal to me who should be questioned first.Then I’ll say, “La policía se duerme” Then I’ll say, “La clase se despierta”, then I’ll tell you who was atacked and we’ll begin questioning to figure out who should be sent to jail. During the questioning, you can tell the truth or lie! While you’re explaining the game, point to the Spanish as you say the instructions on slide 2. Now the storytelling (and fun!) begins…you can give them as much language as they can comprehend. Later in the year I embellish the ridiculous attack stories, but at the beginning I keep it pretty simple. Advance to slide 3 of the slideshow to aid their comprehension. A side note: In the real mafia game, the mafia kills their victims. I can’t do that. I can’t even play about losing a student. I’ve lost 3 precious ones over the years; we don’t go there…My mafia attacks and my victims go to the hospital where they recover at the end of the game. And we all live happily ever after. Sra. Chase: Clase, mira a Emma. ¿Está nerviosa? ¿Emma parece (point and pause on the word) culpable (point and pause)? Again I’ll ask (while pointing and pausing at slide 4) “¿Quién es culpable? ¿Quién cree que Emma es culpable? ¿Quién cree que Drew es culpable? ¿Quién cree que Emma es culpable? Señala (motion the word) a la persona culpable. ¡A votar! ¿Quién cree que Emma es culpable ¿Quién cree que Drew es culpable? ¿Quién cree que Alison es culpable? Students vote and the student with most votes is sent to prison while the class makes siren noises and they walk off holding their hands as if they’re handcuffed. The convicted student exits the circle and sits in a chair in prison, which is conveniently located next to the hospital. Then I’ll tell them if they’ve convicted the right person. At the end of the game, if all the mafia are in prison, everyone else wins! They bring me their stamp sheet and get a stamp! If at least 1 mafia is still in the circle, even if some mafia have been convicted, the mafia wins and they bring me their stamp sheets for an extra credit stamp. Before I played for the first time, it was hard for me to wrap my head around all of this… so I made a little video of my little darlings playing so you can watch an entire round. These are Spanish 1 kiddos, 9 weeks into Spanish 1. This is the first day they’ve played mafia, but I didn’t start filming until our 2nd or 3rd round. Point and pause, that’s the secret here. I’m using this sweet pointer here but you can use anything! In fact, if you’d like to support Señorachase.com you can click on one of my amazon links and buy anything. Seriously, anything you were going to buy anyway, if you click through one of my links to Amazon, I still get credit, regardless of what you buy! You get your shopping done and I get a tiny commission from Amazon. It doesn’t cost you anything and it motivates me to keep writing. Win-win! Gracias, amigos. How do you go on after Round 1 if the Mafia was voted into prison? There are 2-3 mafias and you only send 1 person to prison each round… so you keep playing if one mafia is in prison. The other mafias in the circle play as normal. Does that clear it up? Merci!! Feel free to change the font to fix the accent issue! I’ll link it to the blog post.. I so appreciate your work! We were just playing Mafia as well! !